An elephant with her trunk raised up symbolizes good luck and fortune! Bring these sentiments to your event when you offer these lovely gold metal good luck elephant key chains as favors to friends and family. 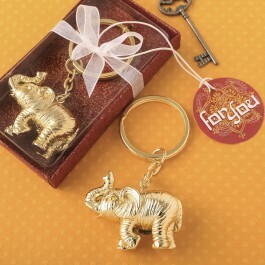 The elephant is made from polyresin and has a metallic gold finish. It is attached to a sturdy gold link chain and split keyring. This stunning favor comes packaged in an elegant burgundy box with gold accents. The box has a clear acetate top for viewing of the elephant inside. The box is wrapped with white organza ribbon and bow. Attached to the bow is a decorative 'For You' tag. Size 1 1/2" x 1" Size with chain is 3" Made of polyresin with a metallic gold finish Attached to a sturdy gold link chain and split keyring A great favor to bring good luck and fortune to your celebration!